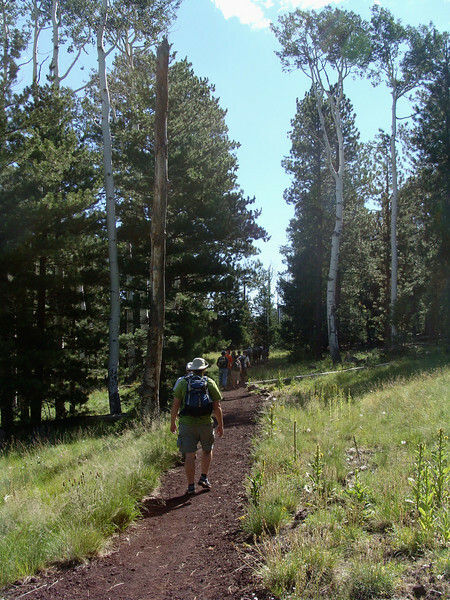 Another 3H Meetup hike, lead by David A. I've never been on the northside of the San Francisco Peaks before, very nice! My SUV managed to take the wrong turnoff onto FR151 (there are two...who knew? ?...okay, maybe I didnt read the directions closely...anyway...) adding almost 10 extra miles of driving on gravel roads, but it was so scenic that we didnt care. :-) Two trails (Bear Jaw and Abineau) plus a forest road made up the loop hike. The Abineau Trail was the first leg of the loop. It started out flat, going through trees and meadows, but soon enough it started uphill, and from there the climb took our breath away, as in, it was quite a workout (lots of elevation gain in a short distance). Along the way we saw where an avalanche careened down the mountain a few years ago and wiped out a swath of trees. (you'll see several pictures of this). We had lunch on some rocks at the juncture of AbineauTrail and the service road (which was not in use, so no traffic). From there we could see the North Rim of the Grand Canyon way in the distance. I took a picture of it using the maximum zoom on my camera. That picture is in here too. After lunch we hiked down the gradually descending road which was surrounded by towering aspen trees. Would love to see this trail in Fall! After a mile or so we came to the juncture with the Bear Jaw Trail, where we started a more serious downhill trek through the forest back to the parking lot. The weather was awesome, probably in the 60's in the shade , and 70's in the sun. Compared to the day before when it was 112 in Phoenix, this was perfect!!! The start of the hike was nice and level, through trees and meadows.